Hello Doodlebugs! 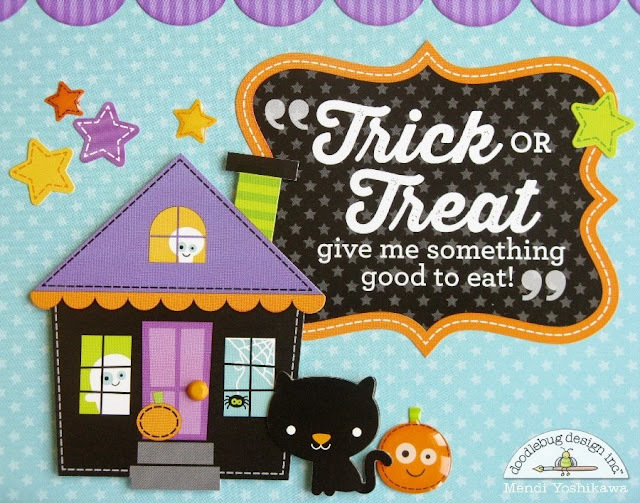 It's Mendi here today and I'm extra excited to share my layout today using the ultra cute October 31st collection! I dare say this is my favorite Halloween collection, ever. I just love the addition of the aqua blue to mix things up! I have been holding onto these photos of my kids for awhile now just waiting for a collection to come along that they would match with. I love the little haunted house icon sticker so I used it as a focal point to create my little scene around. I like to group my embellishments in three's to create a visual triangle which directs the viewers eye throughout the page and helps add balance. For the second point in my triangle I layered a punched circle over a black sticker from the This & That Sticker sheet. The fence from the icon sticker sheet and an owl doodlepop completed the grouping. For the final point of my visual triangle, I added a simple pumpkin sticker layered with a kitty sticker popped up with foam tape. Beautiful LO, the pics are great and match perfectly!!! So cute, Mendi! Love all the little details. Such an adorable layout Mendi! The blue is perfect! Fabulous layout, such fun embellishments you used! Such a darling layout Mendi ! Your Layout is Faboolous.....your pictures are precious and your story is adorable...love the costumes and the great way you showcased them with your outstanding creative ideas. 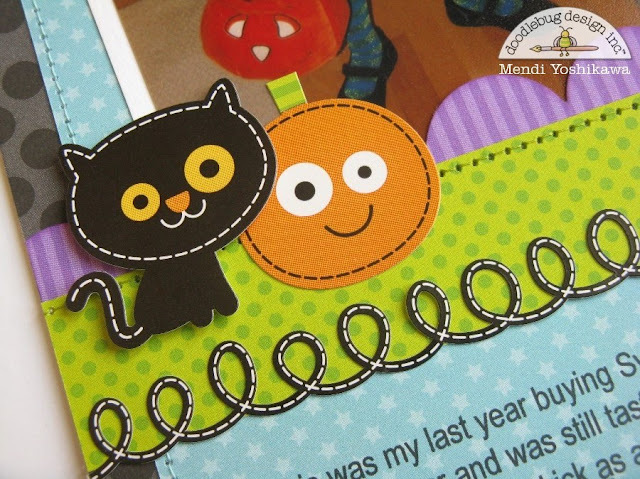 Love your layout, thanks for sharing Mendi!